Suppose you were walking down the high street and you came across a shop selling something you were interested in, but for some strange reason they had a four-foot wall across their doorway. A few doors along is another shop with what you need in it with an open doorway. Which do you choose? Perhaps there are two flower shops – one with blinds down, so you can’t see what they offer, and another with big, clean windows and displays of bouquets and plants outside on the pavement too. These might seem somewhat wild examples, but many B2B websites that are the digital equivalent of all these things. In physical retail, it has long been understood that the fewer barriers between a customer’s interest and their purchase, the better the chances are of making the sale. Online, where there are no physical restraints to moving from one site to another and where choices can be made in seconds, this is even more critical. Let’s face it; a customer can go elsewhere with a single click of the mouse – a tap on the ‘back’ button. This is why the user experience is crucial to any website. B2B buyers are busy and their time is at a premium, not wasting it should be the number one priority for your website development. “I invented the term because I thought human interface and usability were too narrow. I wanted to cover all aspects of the person’s experience with the system including industrial design, graphics, the interface, the physical interaction, and the manual”. So User Experience is primarily about creating systems – such as websites – that are designed from the ground up to be easy for users to access, use, and even be delighted by. You will most likely have come across CX – Customer Experience, as well as UX – User Experience. So how do these terms User Experience and Customer Experience differ, and how are they related? User Experience is a subset of Customer Experience. Whereas UX is concerned with a user’s interaction with a businesses’ website, or other digitally designed experience; CX looks at the entire customer experience with a company. That could include; social media, telephone calls, customer service, meetings, branding, your office reception area, installation, product packaging, and more. In fact, CX looks at any point of contact between the customer and the business. So in it’s broadest terms, CX is the total experience a buyer or customer has with your company. And it will make or break your success. A bad experience will result in a failed sale which the prospect may talk about on social media, affecting other prospects. A great experience will win future business but also convert that person to become an ambassador for the business – an unpaid “super-salesman”. So it pays to get your Customer Experience right, and as a crucial part of that, to get your User Experience right. UX is a critical part of CX because after doing a web search, your website is typically the first contact a prospect has with your business. Mess it up, and you lose the prospect and a potential sale. Why is User Experience suddenly more important now? Since the dawn of the internet, user’s have struggled to use websites. In the early days there weren’t many design options, so websites, were, by necessity, very simple. As technology improved, so did the complexity of websites, and simple tasks like knowing what was a link or a button and what wasn’t, became difficult. Usability became a hot topic, and books like Designing Web Usability: The Practice of Simplicity by Jakob Nielsen became a must-read for web designers. (And although written in 1999, many of the principles are still relevant today). Over the years websites went through two, three, four or more redesigns and usability gradually improved to the point where most web designers incorporated it into their website development. However, in more recent years, with the improvement of both browsers and bandwidth, and the incorporation of more and more interactive features, web development seems to have given less importance to usability and the user experience. Favouring instead impact, movement, and superficial appearance, resulting in many good-looking, if not entirely functional, websites. But now there is a new recognition of how important UX is. With the modern emphasis on analytics and measurement, businesses can see where the flaws in their site are – so there is now no hiding the fact that however pretty a site is, if a visitor can’t use it, then it will not result in sales. Incidentally, there is even a standard for UX: ISO 9241-210:2010 Ergonomics of human-system interaction — Part 210: Human-centred design for interactive systems. What’s interesting about this is that it emphasises a human-centred approach – does that ring any bells in marketing? It should; it is an exact parallel with the Buyer Persona approach we take in inbound marketing. And many UX practitioners use personas in their work. In the same way that we should have a marketing strategy aimed at buyer personas, we should have a website development strategy that is also aimed at those same buyer personas – but one that considers how they would use the website, not just look at the path you want to lead them down as a marketing goal. How do I implement UX? If you have never dealt with UX before, or worse, are somebody who doesn’t believe it is important, then I recommend reading Don’t Make Me Think – Revisited by Steve Krug, one of the world’s leading usability consultants. It’s a simple basic primer, and although you might find yourself often going; “I knew that” – the book does a great job of highlighting the importance of usability with simple, impactful examples. The key to successfully implementing UX is to embed it at the heart of your web development. Once you’ve worked out what you want visitors to do, you then look at the processes that are needed. Everything you do must work well, and be as easy as possible for the user to access and use. That comes first. The slick animations, interactive features, design and branding, should all be secondary to the user’s ability to actually use the site and achieve what they want, simply and with the minimum of fuss. To learn more about UX in depth, look no further than the web; there are thousands of web pages on UX out there; courses, qualifications, groups and more. Adobe, for example, has a good list of UX Design Inspiration sources. Here are five mistakes that illustrate the importance of the user experience. If there is an established way of doing things on the web, then don’t try and be different for the sake of it – use the most obvious way to do something. Bear in mind Jakob’s Law: Users spend most of their time on other sites. This means that users prefer your site to work the same way as all the other sites they already know. If you do things differently they will take longer to do any task, and they will be confused and/or thinking about why you did things differently – either way you have lost their attention and they are no longer getting your message. Don’t be clever – keep things simple. Getting people to sign up for something – offering up an ebook for example in exchange for contact information – is a fundamental part of inbound marketing. But filling in forms is not something that anyone enjoys. So make it as painless as possible for your prospects. Make those forms simple and easy to fill in. Use easy to understand labels alongside the form fields. Have as few form fields as you need – no more. If you have a validation process that checks the data that is entered, don’t reset the form if there is a problem. If someone has taken time to fill in the form, they don’t want to have to do it all again just because their email address is missing the @ sign. The speed at which people can do things is also an element of UX. If it takes too long to do something or page elements take too long to load, your visitor will be gone. So look at the loading times of your pages; remember that not everyone will be viewing your site on super-fast broadband. Those fancy effects and neat animations – they may be the barrier that’s preventing your prospects from engaging. Writing about marketing means that I visit many marketing websites, and the one thing that annoys me the most about many of them is the pop-up asking me to sign up for something that obliterates the screen the second I land on the site. This instantly makes me leave. It is annoying for several reasons. Firstly, I am in a hurry, and I want to find the information I was looking for quickly and now I've been slowed down. Secondly, I haven’t even seen the site yet, so how do I know that it has anything I would be interested in? It’s like selling before the pitch. It’s like walking into a shop and being bothered by the salesperson the second you are through the door. Yes, you should have calls to action, and you definitely should encourage people to sign up for newsletters and ebooks or subscribe to blogs, but let them get onto the site first, let them orientate themselves and be sold to before you jump on them. Remember that user experience is not just about buttons, navigation, and other elements of the web page, it’s also about the experience, the journey, the sequence of steps a visitor has to go through. Make it a pleasant journey, not an annoying obstacle course. It is hard to ignore the facts on conversions from pop up forms, but wait a moment - let the visitor in first. 5) Letting people know where they stand. This covers two issues, the first of which is navigation. You could write pages on navigation, but it all boils down to the basic requirements of a navigation scheme. Users need to know where they are (in the context of the site), where they have come from, where they can go, and how to get back to somewhere familiar (such as the homepage). Your navigation system needs to do this simply and clearly. The second issue is making it clear what a visitor’s options are. These might be menu choices, calls to action or links. Drop down menus are considered a compromise at best, as you cannot see, without clicking them, what options are available. Menu choices, calls to action and links, should all be labelled clearly as to where they lead, in a way that the complete stranger to your site can figure out what they do and where they would lead to. The rule with both of these is ‘no surprises’. These are just five issues I’ve picked to illustrate different aspects of UX, here are another seven usability mistakes that will kill your online sales from Kissmetrics based on data from studies. 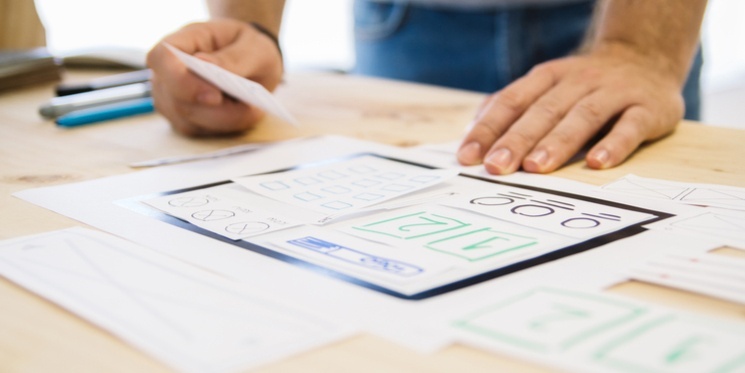 Measurement and analytics are the final elements of the UX cycle – working out where the user experience is less than optimal and measuring the impact of improvements, is essential to the effectiveness of UX design. UX is an iterative process – it should be tweaked and perfected constantly, which is not possible without data to base improvements on. Sadly, unless a business has the right analytics in place and knows what to look for, the impact of a poor user experience on engagement and sales will probably go unnoticed. On the other hand, and somewhat ironically, crafting a great user experience will probably go completely unnoticed by the user (as indeed it should), but the result for the business will be an increase in engagement, conversions, and ultimately sales.